Leading wind turbine manufacturer Vestas have announced the deployment of three ZephIR 300 Lidar systems at the 420MW Macarthur Wind Farm in Australia to provide hub height and full rotor wind speed measurements across the Southern Hemisphere’s largest wind power project. The site already containing six traditional 84 metre met masts, will see the ZephIR Lidars providing critical wind measurements from 10m to 200m to advise on load analysis calculations, for the 140 x 3MW Vestas V112 wind turbines, and to inform turbine warranties conditions for Vestas. 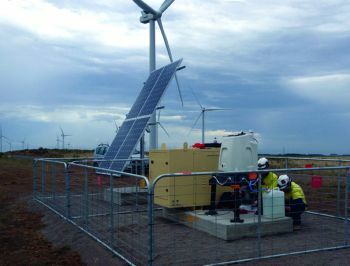 Vestas applied an innovative approach to the 5,500 hectare site (55 km2) where a combination of traditional anemometry and remote sensing devices would provide sufficient coverage across the site, whilst also providing turbine tip height measurements as required from the roaming remote sensing units. Following an extended period of technical assessments, Vestas chose ZephIR as their key provider of Lidar technology based on the company’s extensive track record, Vestas’ existing experience with ZephIR systems and the accuracy, reliability and stability of ZephIR 300 since its launch in 2011. Shane Browne, Senior Manager of Plant Siting & Services at Vestas Australian Wind Technology P/L said: “Data recovery is critical to any wind data analysis we will do in the future and a deciding factor in selecting ZephIR was the service and maintenance strategy offered”.